The Yorkshire Terrier breed is believed to be no more than 100 years old and originated in England - bred for hunting, these pesky little pups are small in size to help them dig into Badger burrows. This super charming tin sign would make a fantastic gift for any enthusiast of the breed, coloured in calming green and blue hues. 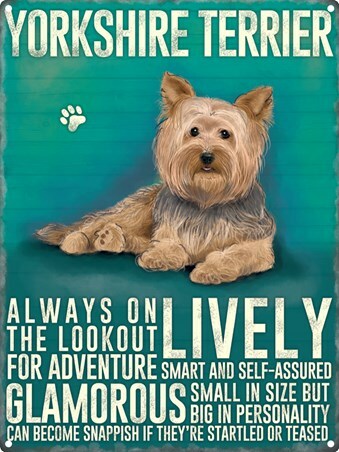 Taking centre stage before a small paw print, is a 'hand drawn' illustration of the Terrier, above a collection of their favourable traits such as: Lively, self-assured and glamorous. High quality, framed Small In Size But Big In Personality, Yorkshire Terrier tin sign with a bespoke frame by our custom framing service.